Tabitha Simmons Strikes Back and in a special preview, there has already been the leading models for the next hot season with its beautiful Resort collection 2013. The young British designer-shoe has invaded the world of fashion and footwear with his designs often eccentric and really original, it is kind of breath of fresh air that celebrity and fashion victims expected, given the ease with which he won the hearts many of them. So even while we admire the beautiful models from its spring summer collection 2012, Tabitha Simmons is already thinking about next summer, let's see what will be the new trend to expect. The line of sandals, as always, is where the designer gives his best. In the collection for next summer will be holding court models like Jane sandals with stiletto heels and covered 12 balanced by a low plateau of 1 cm from the tip covered with open-toe satin midnight blue list, while braided straps hug his neck foot and close around the ankle. 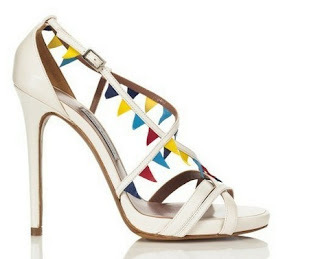 The model variant Poppy Jane alternates proposed high-heeled or flat version, coated canvas with red stripes and blue on a beige, all finished off with ankle strap. Ruler of the collection is undoubtedly the model Pennant leather with triangular inserts that embellish the lists with alternating color blocks very eccentric and cheeky. As I imagine you know, espadrilles are one of the most popular models by shoe addict especially in summer. Tabitha Simmons therefore proposes them to us for next year, but in a form quite different from usual: we speak of very high wedges of 14 cm with para front of 4 cm, the shape of a French girl with strings in the front. Everything is made of rope and canvas stripes! Completing this preview Tabitha Simmons heads the bold the beautiful dancers of the line Alexa, dancers, however, designed with a particular narrow point in imitation of decolletes. They are made of leather with paint effect in shades such as pink and white and electric blue leather with triangle on the front contrast. Models casual but glamorous!